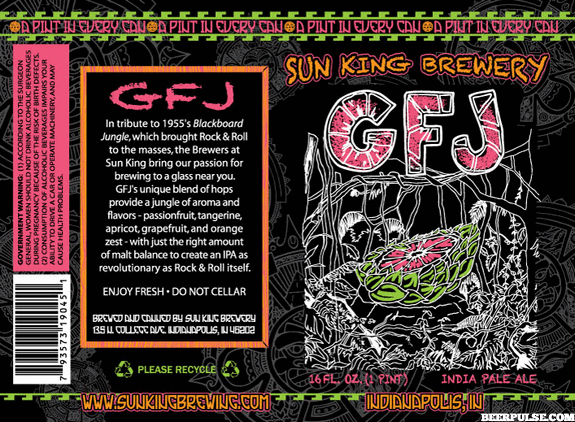 The 2013 limited release cans of GFJ are real slick! The need for specialty orders of aluminum cans has been eliminated! Regular aluminum cans are used sans graphics. A much cheaper plastic sleeve is then purchased in bulk with the specialty graphic print (see design below). The plastic sleeve is then slid over the ordinary aluminum can and heat treated to shrink, conform and hold tight to the can. I know this sounds like nothing, but for breweries this is kinda the next big thing! Pros: Savings in both time and money. Cons: Upfront cost of machinery and addition of a few steps to the canning process. **It isn't Leaning up the canning process, but the savings over the entire value stream more than make up for the added steps. The process is similar to what Nice-Pak Inc. in Mooresville uses in its manufacturing process. It uses shrink film to not only seal product on the down-lines but also package product for its diverse line of wipes. Crazy connections in Indiana, I know! I believe this is the first time I have seen this type of treatment with regards to #craftbeer cans. I know that Guinness has done the same thing only with their nitro infused bottle line. This is the first step in overcoming the higher costs of canning beer! More savings for local brews means more money to invest in new beer ideas! Keep up the good work Sun King! Shrink bands and shrink wrap are the last touch to your items that tell individuals that you are an expert. They indicate that you are worried that the item they purchase, that it is as new as when you made it.